Convinced they were in the wrong jobs, they took a leap of faith (and in some cases a pay cut) and started over. * WHY THE CHANGE? "I'd lost that fire in the belly," says Allen. "There was one god-awful day [in 2002] when we installed a new systems upgrade and it broke." Suddenly the job seemed more burden than challenge. "I said to myself, 'This is a young man's job.' " At the same time, he realized that playing political games had become more integral to his success than doing systems work. "I had no stomach for that." Allen consulted an executive-placement firm looking for a new direction. 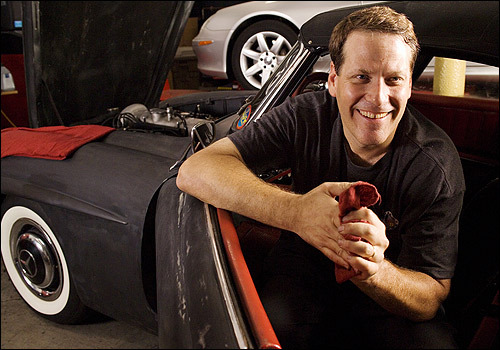 Because he enjoyed working with his hands and seeing tangible results, he pitched the idea of an independent service shop for high-end cars to two mechanics and a service manager he knew. They formed a partnership and opened for business last summer and, at the end of year one, they're turning a profit. * WHY THE CHANGE? A good experience working with Roxbury funeral director Rebecca Ridley after the death of her father got Wise's mind churning. 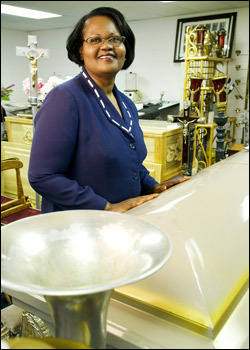 "I had never met a female funeral director before," she says. "I was impressed by her professionalism." As they became friendly, Wise realized that her advocacy work for victims of domestic abuse was similar to Ridley's work. "You accompany a person on an intimate journey at a difficult time, guiding them," she says. Wise also thought she had the right mix of traits: "I can keep a level head at a tough time, talk slowly and reassuringly, and I'm respectful of people in crisis." Although Wise felt challenged and fulfilled in her last job, the constant heartbreak wore her down, and at times there was imminent danger. So Wise planned to become a funeral director - but before she graduated from mortuary school, the college offered her a job. * WHY THE CHANGE? Howard (shown here with her daughters) soured on her first career back when she was an accountant in Boston in the late 1990s. "I was working 60 hours per week, sometimes from 7 a.m. until 1 a.m. My boss would ask, 'Are you coming in on Saturday?' " Howard did work weekends but felt she wasn't being recognized for her dedication. "When you put your heart and soul into something, you want to be appreciated," she says. "But you'll never be fully appreciated unless you work for yourself." Howard and her husband, Jeff, had bought 3 acres in Oakham in 1998, and together decided to farm the central Massachusetts property. 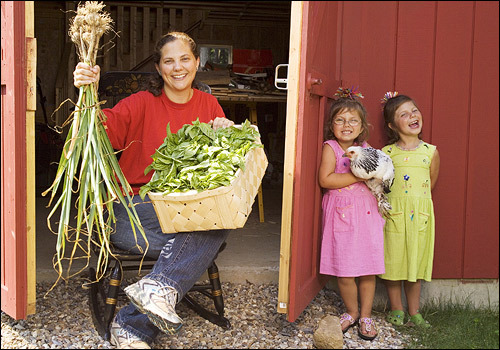 To learn the trade, the couple called on other garlic farmers and consulted with food scientists at Cornell University. In 2003, Howard left the corporate world; her husband still works as a financial analyst but plans to join her as a full-time farmer in three years. They made their first few batches of pesto at a community kitchen but have since spent $20,000 to construct one in their home. * WHY THE CHANGE? After 15 years of working in high tech, Lin felt his career lacked meaning. "It was more insidious than an epiphany," he explains. He had worked for Yahoo in California at the right time - cashing out with hundreds of thousands of dollars in stock options - but felt a vacancy. "I remember describing my work at one point as feeling my soul leaking away." By 2000, he rekindled a longtime desire to become a therapist, first hatched during his adolescence. In 2003, upon hearing that the majority of therapists in Massachusetts were social workers, Lin investigated several master's programs. He had an undergraduate degree in psychology from Harvard and felt the pieces of his life might soon fit together. He applied to Simmons College's two-year socialwork program and graduated in May. * WAS IT WORTH IT? Even though Lin already has those first-day-of-school jitters about starting his new job at the end of this month, he feels a sense of inner calm. "It's the first time I'm 100 percent behind what I'm doing." Despite a serious pay cut - Lin's previous salary hovered around $90,000, and he'll now fetch a teacher's salary - he says it's an honor to be working with people during their crucial teenage years. "There is so much suffering in the world," he says. "I believe everyone can suffer less, if not be happy. hope to help them experience more moments of happiness." Do We Really Need A Law To Protect Fat Workers?